Luxury Yacht Felicita West reduced Weekly Rates for Summer 2010! Felicita West have reduced their weekly rates for the remainder of the summer 2010! 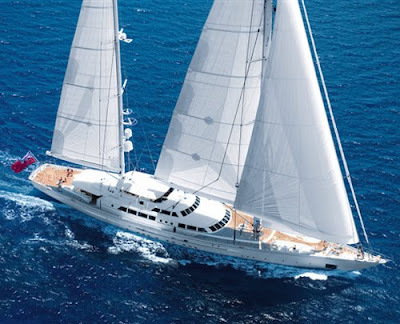 This spectacular sailing yacht accommodates up to 12 guests in five cabins. Currently in Montenegro, the crew are on 24 hour standby, ready for a last minute charter. All accommodation on lower deck. Full beam (41.5') master suite with sitting room, walk-in wardrobe and superb bath. Two queen-bedded cabins with pullmans, and two twin-bedded cabins with pullmans. In family situations pullman berths may be used to accommodate 12. (Children on the pullmans). Pullmans are for no one heavier than 60-70 kg max.